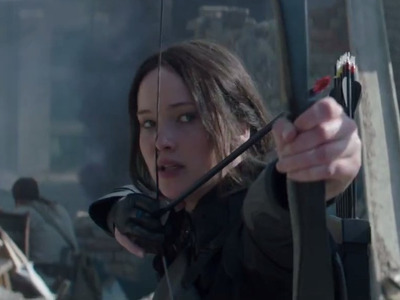 Lionsgate/The Hunger Games trailerDespite a huge opening weekend, ‘The Hunger Games: Mockingjay – Part I’ has the worst debut of any ‘Hunger Games’ movie. “The Hunger Games: Mockingjay – Part I” had a huge opening weekend grossing $US123 million making it the biggest debut of 2014. That number puts the third “Hunger Games” instalment ahead of Paramount’s June release, “Transformers: Age of Extinction” which opened to $US100 million. Despite that win, the opening weekend numbers for “Mockingjay” are lower than expected. Estimates were calling for a $US150 million weekend. Instead, “Mockingjay” made less opening weekend than its previous two installments domestically. Here are the box office numbers for all three films side by side. “Mockingjay” is already performing better overseas than at home. What’s going on? There are a few reasons for its weaker performance stateside. The film had competition from “Big Hero 6” and “Interstellar” and received worse reviews than the previous two installments. “Mockingjay” was also the first big release in theatres since 2009 to not get an IMAX release. Instead, all IMAX theatres will continue playing Christopher Nolan’s “Interstellar” until “The Hobbit: The Battle of the Five Armies” debuts next month. The Wrap reports IMAX screenings contributed over $US12 million to the box-office opening for “Catching Fire” last year.